All Purpose Glazing is your best local source for glass shelves and mounting hardware to give your home or business a modern customized appearance. Our glass shelves are designed with the perfect blend of style, functionality, durability, and affordability to fit your needs. We create custom shelves out of glass at whatever length, depth, and thickness you need. Most of the time these shelves have exposed edges, giving you the option of adding another level of detail to better reflect your personal style. After choosing whether or not you want a rounded or flat edge you get to choose between a polish or grind; whether or not you want a shiny, or smooth matte finish. This small detail can impact the overall effect you are wanting to create in your space. 3/16″, 1/4″, 3/8″, and 1/2″ are usually used for shelving. 1/4″ and 3/8″ are by far the two most popular shelf thicknesses we sell. 1/4″ shelving is usually used for economy, since thicker glass is more expensive. 3/8″ is usually used for high-end applications and can really make a stunning difference. Other than cost and aesthetics, thicker glass can also support more weight. 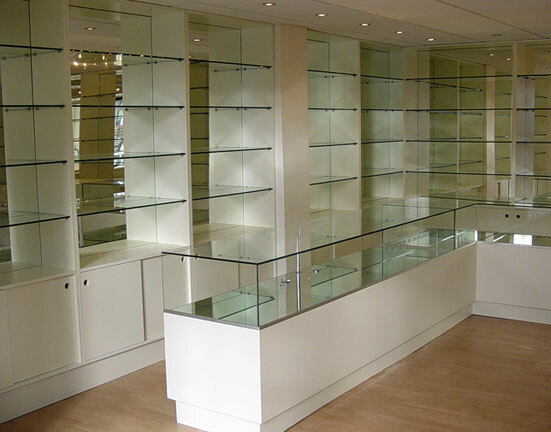 Tempered glass can be used can be used for shelves in display cases on as shelving on wall systems. Tempered glass is shatter resistant providing added safety; we can supply this glass with Low-E clarity for a clear and sleek and sophisticate design. These custom made glass shelf makes the perfect storage solution for your bathroom, while adding a touch of contemporary style to your decor. Used By Interior designers for Jewellery and shop displays. Toughen glass will enhance the sculptural and functionality of a glass shelf adding strength and a greater weight capacity but most of all the safety this tempered glass shelf promises an inviting visual appeal of classic modernity, and features solid brass construction. Toughen glass is the perfect chose for a glass table top to ensure long life and resilience to scratches. A safety glass which will brake safety into little “cubes”, instead of dangerous glass shards in the unfortunate event of accidental breakage. Toughen glass is 5 times stronger than normal glass. This allows a thinner/lighter piece of glass to be necessary to provide the same level of protection. Toughen glass is more thermally stable when in contact with hot objects this is why it is the preferred material for kitchen spalshbacks behind a stove or hob. Low maintenance and a hygienic material clean. Quality glass processing and finish options. We carry a variety of hardware options from top suppliers to fit your desired look and budget. Our estimators and installers are glass shelving experts and ready to help you get just the right product for your home or business. We have the skill and expertise to custom design and UV Bond glass shelves to make decorative feature pieces to truly customise your glass shelving. All Purpose Glazing has the products, knowledge, and installation expertise to simplify the process and get it done right. Contact us to order your glass shelves for extra shelf space you need, Glass Shelves made to measure supplied throughout Ireland. Unlike many companies offering bespoke glass, based in our factory in Derry City we have our own processing team with the latest in glass C.N.C. technology, giving us the ability to produce glass to the highest quality.